A RHYME FOR THE WINTER FIRE. Sheathing his sword, and declining to fight. Of a beau who had always forgotten God. As old as the hills, on a tavern table. That kept all his household in durance and slavery. Than allowed her to speak twenty words in his church. For donkeys to gnaw at and munch at for hours. That she was the Beauty, and he was the Beast. The dryest old abbot quite juicy and tender. On whom hung the tales that Grammont has narrated. And her pride was the sign of her lowliness. Mind into Beauty, that passionate mentor. Such songs as the full “Penseroso” of Milton. Were drawled through the nose, or roared out over wine. And to draw their home-tenderness into her soul. The debt of their earthly aspirings to God! Like a Scotchman’s wit when replenished with toddy. By cutting the cards, how to cut a throat! With the blood of a lady, the brain of a clown. Clutched at the cards with his fingers unsinew’d. “You’ve a daughter,—Miss Edith?” the other continued. “A baggage!” cried Curll. Quoth Sir Templeton: “Come! And who wouldn’t sour in an air that’s so glum? For myself, Curll, I’m willing to make her my wife. While his eyes bled wine. His Highness, of course.” “By my sword, Trench”—“There! You're fully as likely to win as to lose. “I agree!” he cried, with a croak, “for—pshaw! He spoke in the heat of his revelry. Was mixed with Bordeaux and the sharp Cognac. Tenderest oaths at the two trembling ladies. Argutos inter strepere anser olores! At the jests they made. Cut sharp as steel thro’ the shadows of night. When she passed from the hall with a look that defied them. Those types of her Soul and complexion, her guineas! And the cook had the flavour of plums in his mouth! And the big-bellied priest had announced the event. Filling his glass with a trembling hand. Was mimicking flowers on the cottage-pane. Was full of the wind and the shuddering rain. In the blackness they bought with his gold arrayed. And you knew by her murmuring lips that she prayed. Then she stood erect, very cold and white. On the Soul of thy mother, my Sweet, my Sweet! On her breast, and died! As I’ve told it to you, I heard it told. Which sharpens our sense of the mirth we’re enjoying. Died blessing six children at seventy-three. ‘The Lady Curll’ was published in The Welcome Guest (March, 1861). More information about Buchanan’s pseudonym, ‘Newton Neville’ is available here. But I look on the earth—and, lo! Sweet prophecy, old or new? To beauty and sorrow too. When the snow is re-born in the showers? To the season of buds and bowers? United,—the snow and the flowers? When its errand is done, let it go! If the errand be gentle or no. ‘The Snowdrop’ was published in The Athenæum (23 March, 1861 - No. 1743, p.395). I found that hope of heaven, Love. Untroubled in a bride’s blue eyes. And we had little schooling). To help each other as we might. A heart grown hard with loneliness. With laughing babies in our eyes. And often going out in sin. The seed of godhead, down to dust. From God the Father’s beauty. Deems every smiling face a lie. On her who loved so truly. The patient face that smiled on me. With body starving, soul a-thirst. By owning Satan in my soul! And took the sweetness of his face. Christ then was in our Nazareth. And calm is in his carriage. We leave our hearths and follow Him! With thrice the strength I had before. A second boyhood in my blood. And show a sky so blue! Was lady of the land. And joy was with my wife and I. Tried with the mystery of tears. Kissed down my sterner soul. A rainbow thread of beauty. The golden link ’tween use and love. Use, through the mystery of Love. My jewels round my neck! Within a music made by wings. I blessed my babe and wife. And both complete the valley-flower. 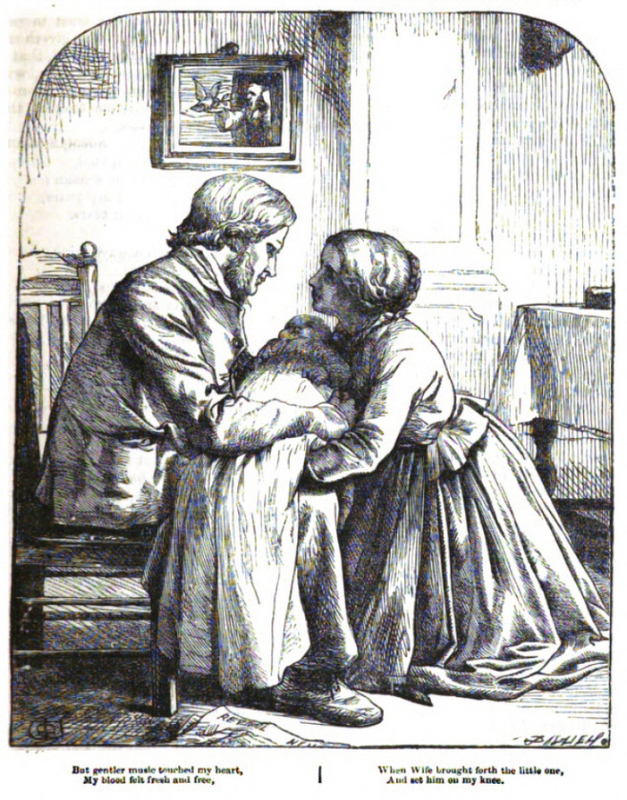 ‘An Artisan’s Story’ was published in Good Words (April 1861). The sinning and hungry grovel. Painted escutcheons with Saxon blood? Is sewing my lady’s shroud! Will the worms pay honour to noble birth? In the Bethlehem men call Marriage? Dragged down to duty by infant hands. Beats for a high-born lover. And a beckoning babe in heaven! To the bloody tears of the mother. For joy that levels but never blinds. And a drunkard’s dream in her brain. Than the love that wooed it down? And this Christ is a little child. To smile alike upon rich and poor. Newly white with the milk of the mother. And of such is the kingdom of Heaven. And the Father forbids them not. The highest and lowest of humankind. And smiles on the baby that crows on the knee. For the generation they herald in. Are working the self-same mission. Eve from her use and her tribulation. And burn, like the ruby, inward. Which floats in dreams from the vale beyond. And the head of the house is Adam. Shine, like a star in a cloud, above her. ‘Belgravia’ was published in Temple Bar (No. 6, May 1861). Appealing to my sterner man. Should lean upon my grosser strength. Why take our little child away? With one Spring’s sunshine in his eye? Yet rob us of our claim on Thee? Just when he learned to lisp your name! He was our Bible for a year. To us than other children were. In sparkles, as it once had done. With tender offices of death. And hush it into dreamful rest. In a white trance of sighs and tears. We were so happy, best of wives! Caught sunshine in the very shade. To leave it there at God’s command. Our little babe now gone before. Which brought the sunshine and the rain! He was a Peacemaker divine! Sweeten your heart, yet blacken mine? Ere laid so low to-morrow morn? Was sitting smiling on your knee? Should sleep such sleep and dream such dreams. To faith that wears a firmer form. Across a driving mist of storm. Those quiet shadows from your face. Across the dim mesmeric sense. Seems part of all sad loveliness. More closely with your own, dear. Lo, there our little darling lies. Mingling with earth among his curls. Like gold-down from a butterfly’s wings. Is like the falling snow without? No help from any meaner creed. And harmonises GOD with each. He’ll fill those footprints full of flowers. The heart’s forget-me-nots and daisies. Is it not so, my darling wife? Will hush the tumult of our life. The children shouting in the town. Is white as lilies on the wave! Between our shadows and his grave! But cannot reach his sweet repose. Teaches a pain akin to prayer. The sweet lost joys that we have known. Keep this calm kiss upon your brow. And showering kisses on the boy? Beyond the statesmen of our isle? A teacher wiser than the three. A common little thing of clay. With our last kisses on his brow? Death has bound closelier our twin lives. Will plead in heaven for his life! God giveth His belovèd sleep. As that calm churchyard with its woe. Let us not doubt, dear, while we weep! Hid from the sunshine of the sun. And change to fairies of the flowers. And, praying prayers there, make me pure. ‘The Dead Baby’ was published in Temple Bar (No. 7, June 1861).